Contrary to initial impressions, this is not Patti riding a chariot in some version of Joan of Arc. The backdrop depicts Patti as the lead singer in "Semiramide" - an opera in two acts by Gioachino Rossini. The libretto by Gaetano Rossi is based on Voltaire's tragedy Semiramis, which in turn was based on the legend of Semiramis of Babylon. The opera was first performed at La Fenice in Venice on February 3, 1823. Semiramide (Semiramis) was Rossini's final Italian opera, and took the form of a return to vocal traditions of his youth, a melodrama in which he "recreated the baroque tradition of decorative singing with unparalleled skill". The ensemble-scenes (particularly the duos between Arsace and Semiramide) and choruses are of a high order, as is the orchestral writing, which makes full use of a large pit. Rossini wrote the title role for his wife, Isabella Colbran. The work starts with a well-known overture, and throughout it calls for outstanding singers in the leading roles. Although the overture is one of several of Rossini's to be widely recorded, the opera is only occasionally performed. The score to Semiramide was unusually long and elaborate, but Rossini boasted that this was the "only one of my Italian operas which I was able to do at my ease; my contract gave me forty days!" Actually, it took him only 33 days to complete the score. Clearly the reason why Patti chose this particular image was because she was a great admirer of Rossini, and this was regarded by Rossini as a part requiring 'unparalleled skill" on the part of the singer. The fact she could perform this vocally complex leading role to Rossini's satisfaction must have contributed to his respect for her, to equal the respect she had for Rossini. This puts the curtain in its context. 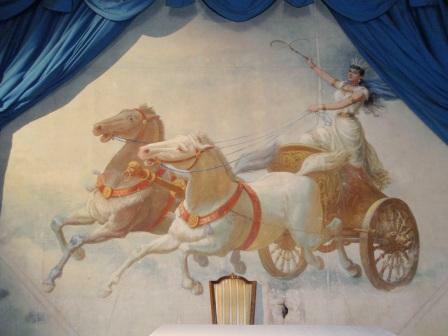 It is more than just a pretty picture of Patti on a chariot and horse. It is an expression of her reaching the pinnacle of her artistry, being able to handle such a demanding leading role, positioned as it is below Rossini's name in her private theatre."